Learn how to Prep-A-Dino! We have two types of Prep-A-Dino Packages available – day packages and onsite stay packages. Both types of package are available for varying lengths. 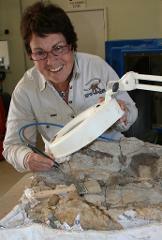 Working with dinosaur bones involves patience, a good eye and a steady hand. Our Laboratory is open from 9am to 4:30pm, 7 days a week. Please note: from mid-October to end of March the lab is closed on Sundays for Summer Break. We are also closed Christmas Day and Boxing Day. We have two types of Prep-A-Dino Packages available – day packages and onsite stay packages. Both types of package are available for varying lengths. If you are interested in participating in the Prep-A-Dino program send us an enquiry and a friendly AAOD team member will be in contact shortly to confirm your place. WHERE: The Museum is located 11km from the Landsborough Highway turnoff. The road to the Museum is sealed and caravans can be towed up The Jump-Up. There is a caravan unhitching area at the foot of The Jump-Up if you are towing with a small 4WD car or do not want to take your caravan up the steep ascent. To take your caravan up The Jump-Up, drive to the conditions in low gear and park in the designated area in the Reception Centre car park. 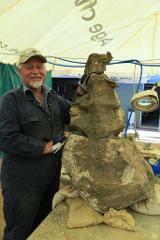 The Australian Age of Dinosaurs requires full payment before Prep-A-Dino participants arrive. The Museum will hold your credit card details until a final confirmation email has been sent with an agreed upon full quote for your experience. Every experience is different, we will be in contact with you to confirm your date and price after you submit your enquiry. You are able to pay via credit card, direct deposit or cheque - however all payments must be received before your Prep-A-Dino experience. Please bring a copy of your payment receipt with you when you check in. Please read the terms and conditions for more details.